This is truly a curious question because I don't really see the point. Why do you use paperbags when you are going to cover it with pretty papers? Isn't the point of using the material is to explore and expose its own properties and make it pretty without covering it with other types of paper unless, maybe, you're collaging on it? I mean, why call it paperbag album if you can't see the paperbag? I don't understand. Honestly, if it is just utilizing paperbags as another material and it isn't being called paperbag album, I won't be asking this question. 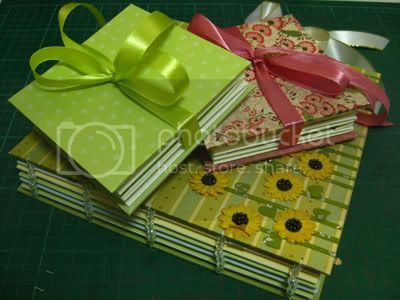 The one on the bottom is an 8"x8" modified coptic bound blank scrapbook album. I inserted beads in between signatures to give the pages more room for pictures and embellishments in terms of thickness. The kite string still works wonders and it actually has a sort of paper-y texture. It's like a really thin paper twine to the touch. I quite like it. I never made any list of resolutions at any time ever. Well, except if it's a school requirement back then and we all know some of them were done because they're requirements and unreal. I thought it's always a useless thing, well, as it applies to me. I always just went on about my life, carrying on, doing things that need to be doing and that's it. Well, now, I'm making one. Just one. I thought I'd make one that is tangible and most likely to be accomplished. A bit lofty, actually, but I'm challenging myself. Like I said before, I'm not really an avid scrapbooker. I make them for others. It's what I do. This year, I'm going to change that because I'm making it my goal to finish three albums I kept putting off since seven years ago. 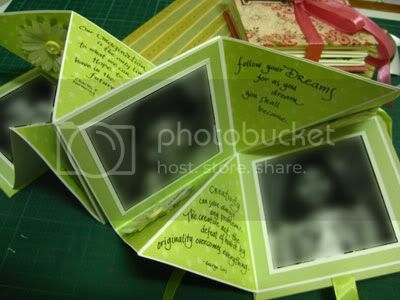 First is our wedding album. I know! I know! That's why I'm putting this here. It's especially difficult to finish something personal than to finish something for somebody else with pay, you know? Second, is that great Bohol trip of 2004. I actually started that already. And third, I hope to complete a one-page a month album for 2010. I'm thinking, considering, to document my progress. Hmmm. I'm still on the fence on that one. There's one other thing I'd like to do but this will depend on my resources that's why I'm not putting it up there. I plan to start re-printing old Florese family photos from our collection of negatives. I'd really love to complete those again. Thank God, my late father's a packrat. He kept all those negatives. Next year, I will definitely revisit this post and see if it's worth doing at all. Resolutions, I mean. Wish me luck!!! Finally saw the last episode of Doctor Who with David Tennant. David, you'll definitely be missed. Wishing everyone a better year ahead!! Better in everything, I hope. 2009 was not really a good one for most of us for many reasons which I won't list here at all. I don't want to attract bad vibes into the new year. I'm sick as it is. And it's Election Year as well. Please, please, please, choose wisely. Pray and ask for guidance before you choose our leader. We desperately need divine intervention! Still, let's be optimistic and look forward to a more joyous, prosperous, peaceful year. Cheers!! !